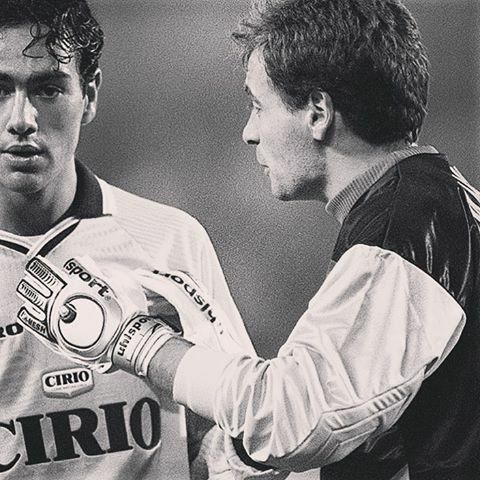 Ballotta signed with Brescia Calcio in 1994, being relegated in his sole season. 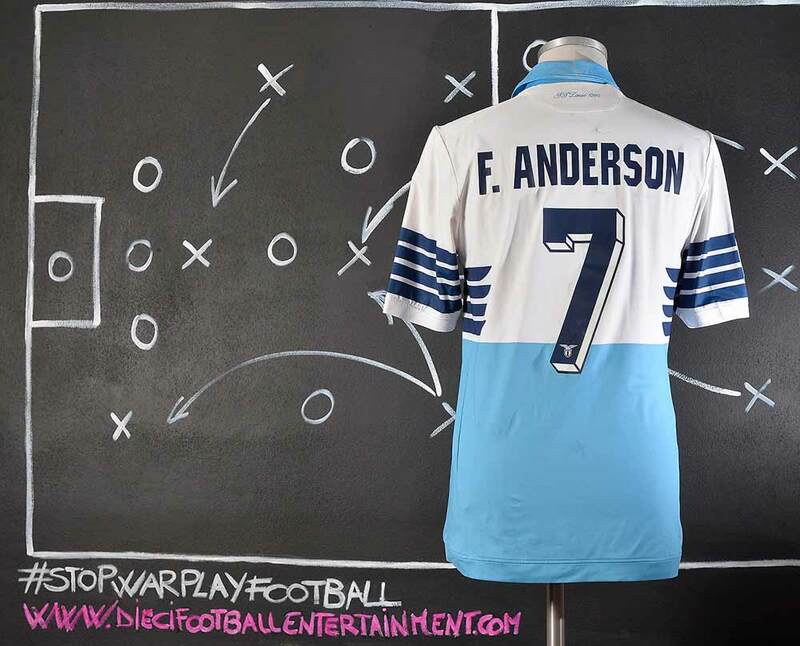 He then spent the following campaign in Serie B with A.C. Reggiana 1919, achieving promotion at the first attempt. 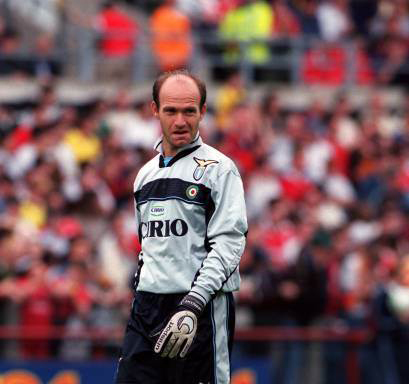 After being immediately relegated, he left for S.S. Lazio for 1997–98, initially as third-choice. After three seasons with the Biancocelesti, Ballotta enjoyed a brief stint with Inter Milan, who acquired the player for 7 billion lire (as part of Angelo Peruzzi’s 40 billion lire move to Lazio). During this timeframe he was also loaned to Modena, helping them gain promotion to the top flight in 2002 and subsequently signing permanently for free. 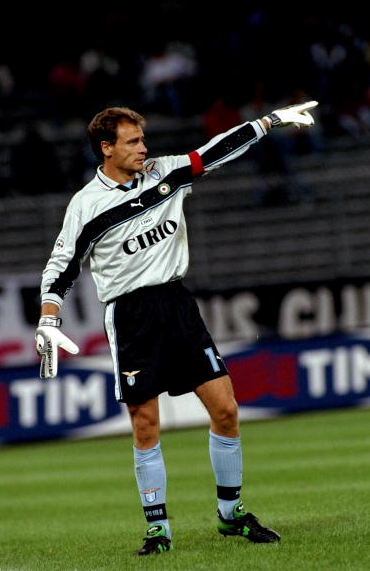 In the 1999-2000 season Lazio won their second Scudetto of their history, and their third Coppa Italia, completing an historical double. By late March, Juventus topped the table by nine points over Lazio with only eight games remaining, but they lost to Milan, to Lazio at the Stadio delle Alpi, and to Verona, with Lazio only dropping two points, against Fiorentina. 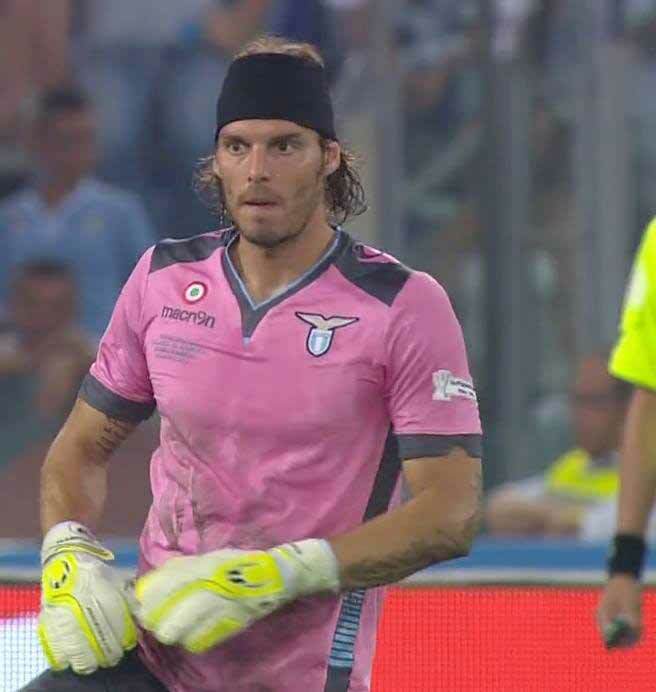 Lazio won the title on the final day of the season when Juventus lost their match against Perugia 1–0 on an almost flooded pitch, while Lazio comfortably beat Reggina 3–0 at home at the Stadio Olimpico. 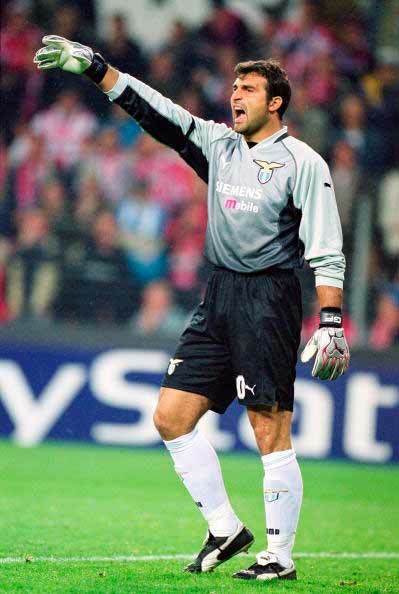 In Europe, Lazio was knocked out at the quarter-finals of the UEFA Champions League, but won the 1999 UEFA Super Cup against Manchester United. 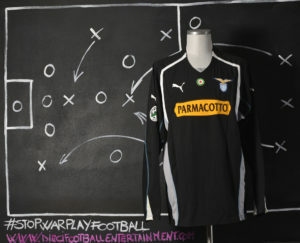 2000-2001 was the season of the S.S. Lazio’s centenary. A white celebrating shirt with a 100’s logo on chest was used by the team. But something on the shirt was very weird. 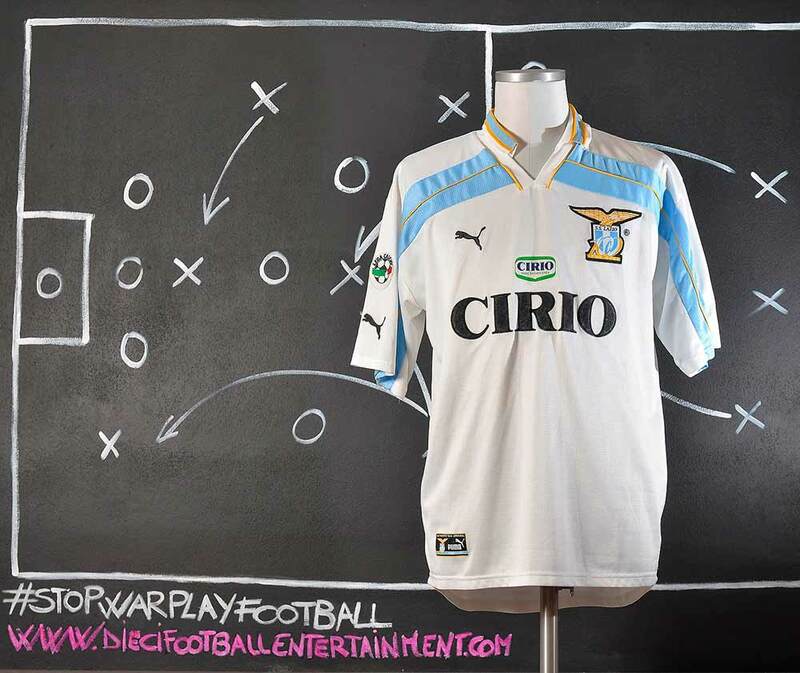 The scudetto badge was sewn on a Puma logo on chest which is not visible. The reason? 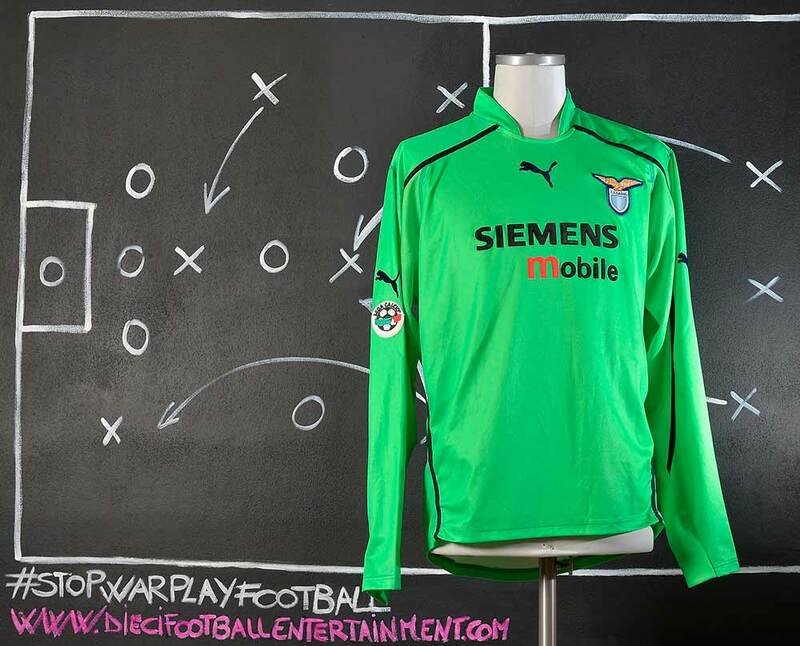 Puma made this style of shirt some months before the end of the Serie A 1999-2000. 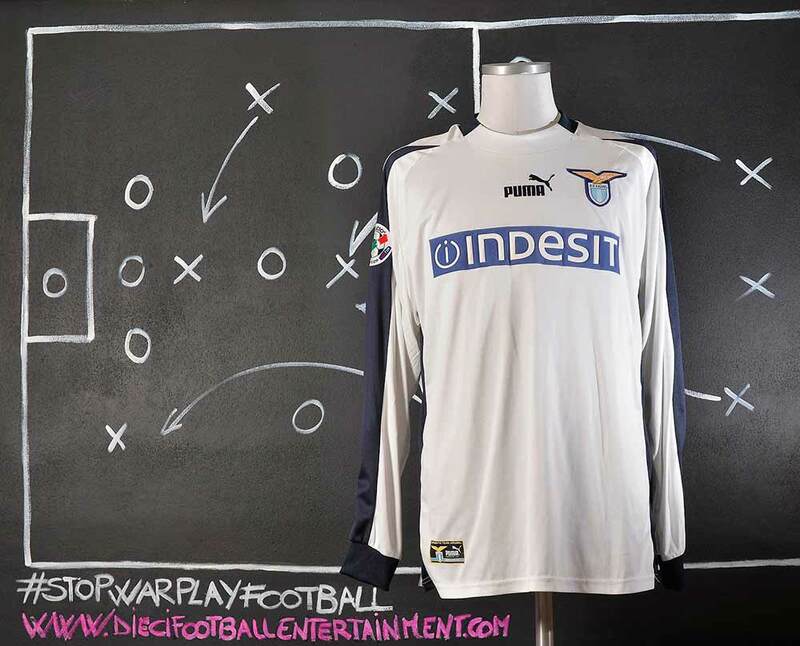 But they couldn’t expect that Lazio was going to win the title so the Puma logo was on left side. 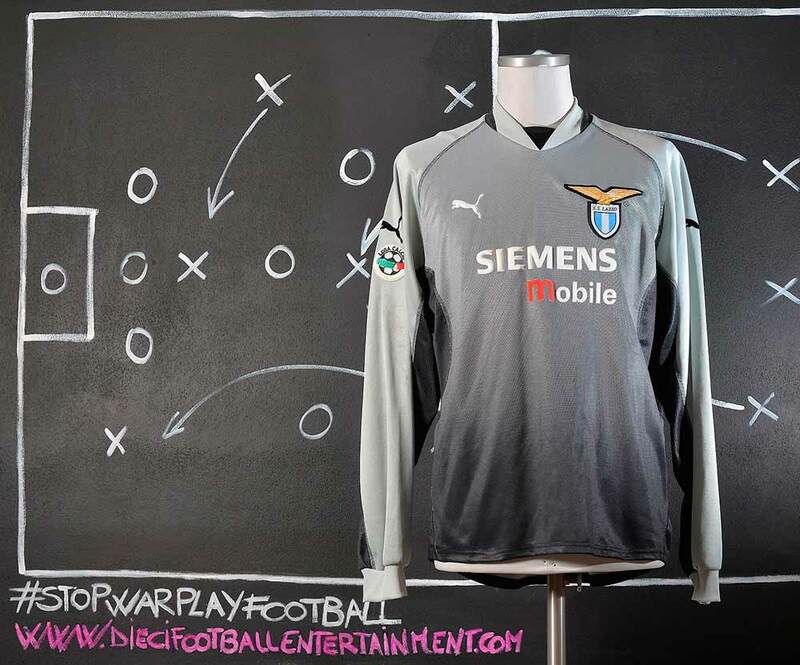 Once the team won the Scudetto, Lazio wanted to have the Scudetto on regular left side. 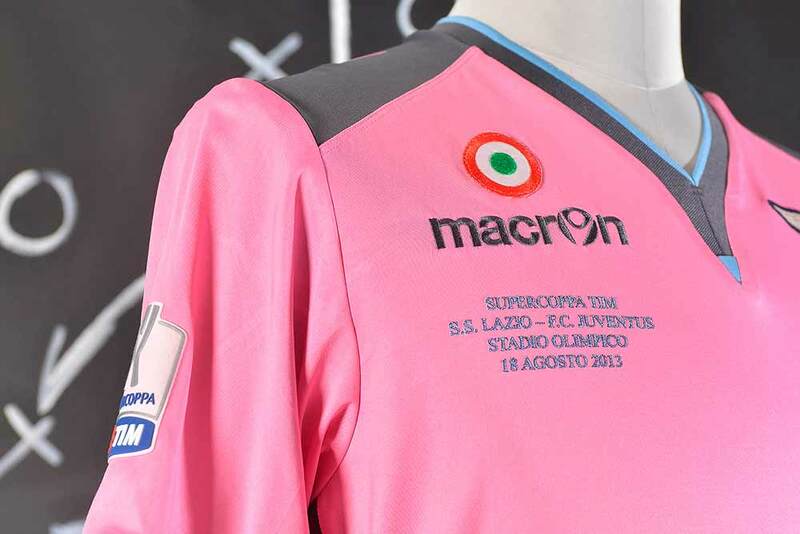 So Puma added a new Puma logo in the middle chest and let the Scudetto badge covering the previous one. 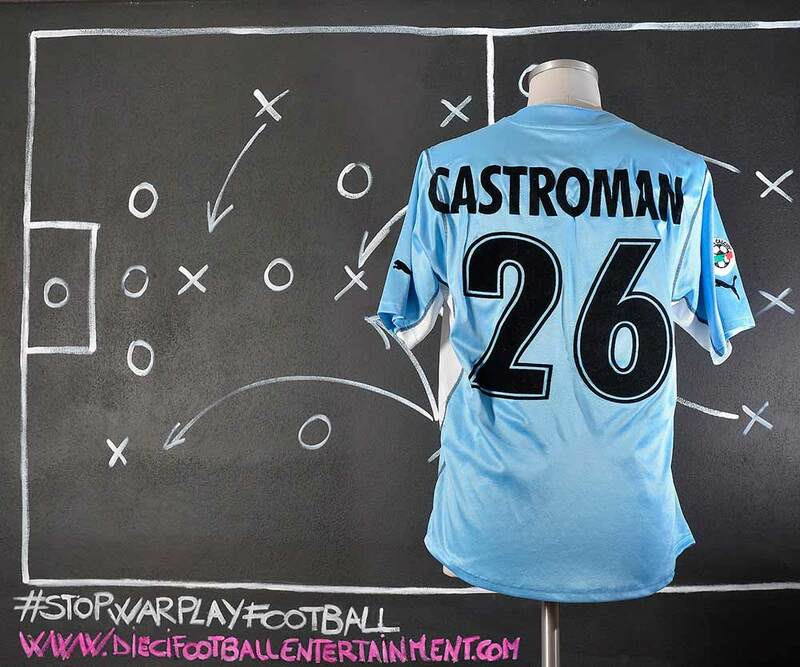 This shirt was issued for Lucas Castroman for the game against Internazionale F.C. which took place on 5 May 2002. This date is definitely an unbelievable date for the Italian football. On this day Juventus completed a remarkable run to the Serie A title, thanks in part to a season-end collapse by Inter. It was the last day of the season and Inter had been at the top of the table since 24 March. On 30 March, they had a six-point lead over Juventus, who were then in third, with Roma in between. But Juve went on an unbeaten run to climb into second, while an Inter loss to Atalanta and draw with Chievo saw their lead shrink to a single point. 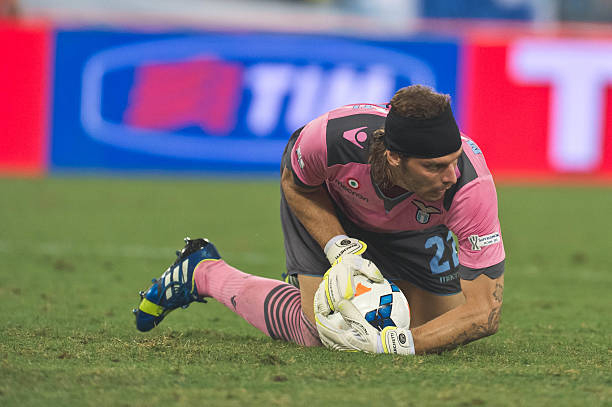 Roma had dropped to third, but were separated from the top by only two points. 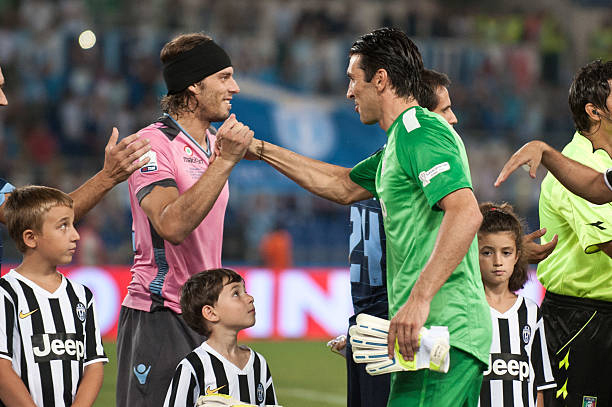 All three teams were away for their final matches of the season, Inter at Lazio, Juventus at Udinese, and Roma at Torino. In his pre-match conference, Roma manager Fabio Capello took a fatalistic approach to the day, saying that he expected all three teams to win, leaving the table unchanged. As it turned out, he was two-thirds correct. 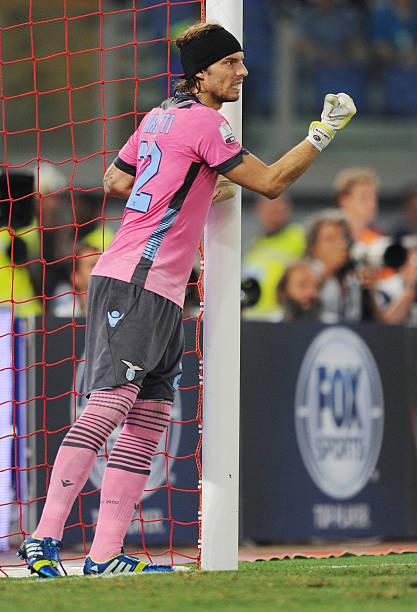 Both Juventus and Roma went on to win–0-2 and 0-1, respectively–but Inter fell hard to Lazio. Despite taking a 1-2 lead in the first half, they went into the break level at 2-2, then surrendered a pair of second-half goals to fall 4-2. The results pushed Juventus into first, Roma into second, and Inter into third. In the 1999–2000 season he led Lazio to the Scudetto and Coppa Italia, winning the double. 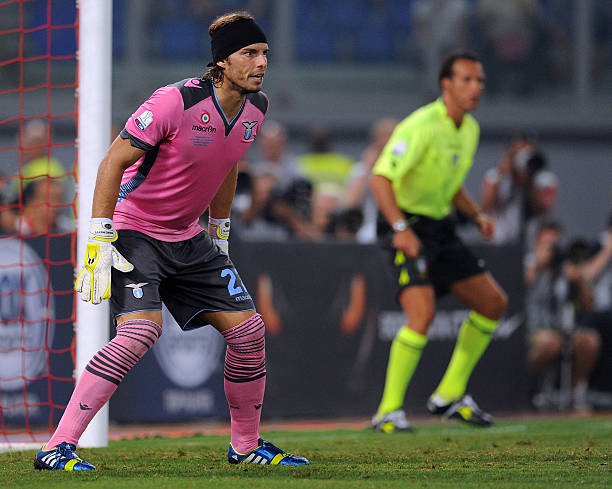 During the 2000–01 season, under Dino Zoff, Lazio won the Supercoppa Italiana and finished third in Serie A. Nesta’s performances and success for Lazio during this period earned him three consecutive Serie A Defender of the Year awards between 2000 and 2002. Financial problems for Lazio and its then-president Sergio Cragnotti led to the sale of Nesta to Milan in 2002. Nesta left the club with a backlog salary of €2 million, half of which were converted into shares of the Biancocelesti club. 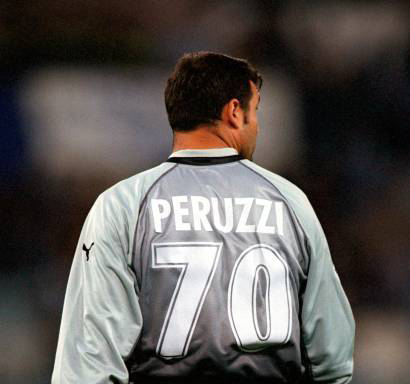 In the 2000-2001 Peruzzi transferred to Lazio for 40 billion lire (€20.658 million; in cash plus Marco Ballotta deal), and made over 200 appearances in Serie A and European competitions with the club, winning the Supercoppa Italiana in 2000 and the Coppa Italia in 2004. 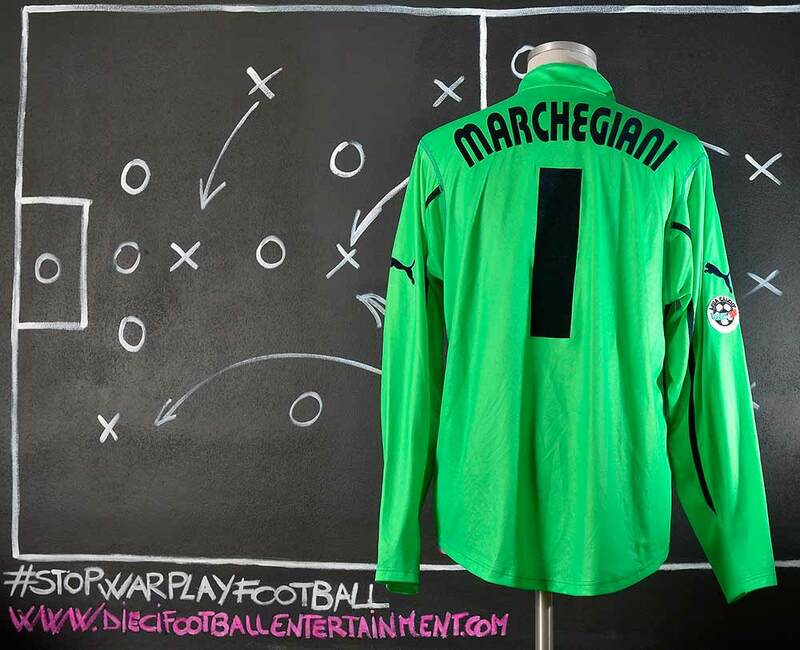 He kept playing at a very high level, being generally considered the best Italian goalkeeper behind Gianluigi Buffon. Marchegiani spent the majority of his career at Torino F.C. 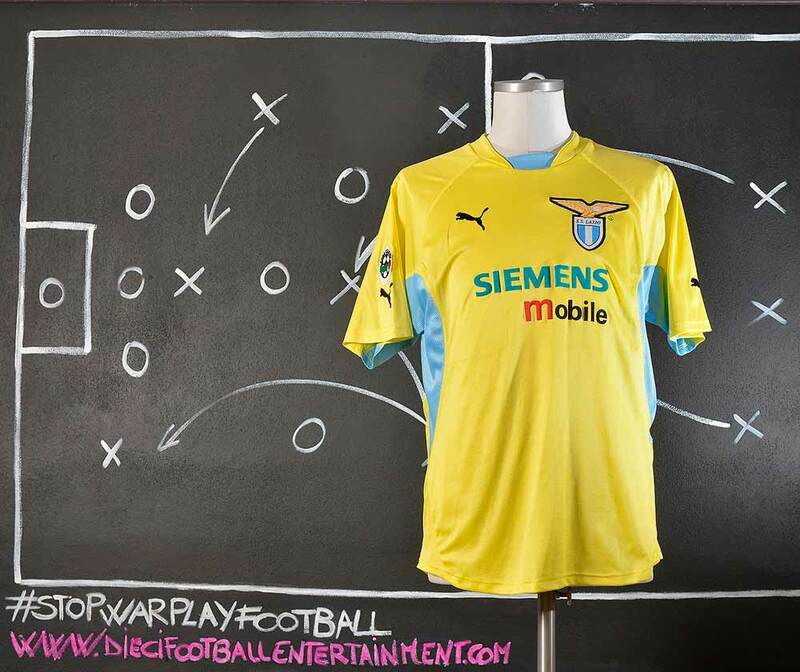 and S.S. Lazio. With Torino (1988–1993). 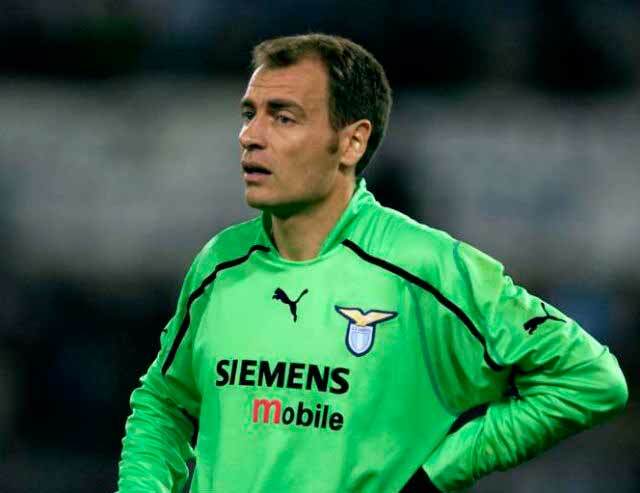 At one point in his career, Marchegiani was the most expensive goalkeeper in the world, when he joined Lazio from Torino in 1993 for £6m; during this period he was regarded as one of the best and most reliable goalkeepers in Italy and in world football. 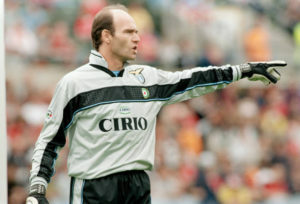 During his time with Lazio he won the Serie A, two Italian Cups, two Italian Supercups, an UEFA Cup Winners’ Cup, and an UEFA Super Cup, also reaching another UEFA Cup Final in 1998. 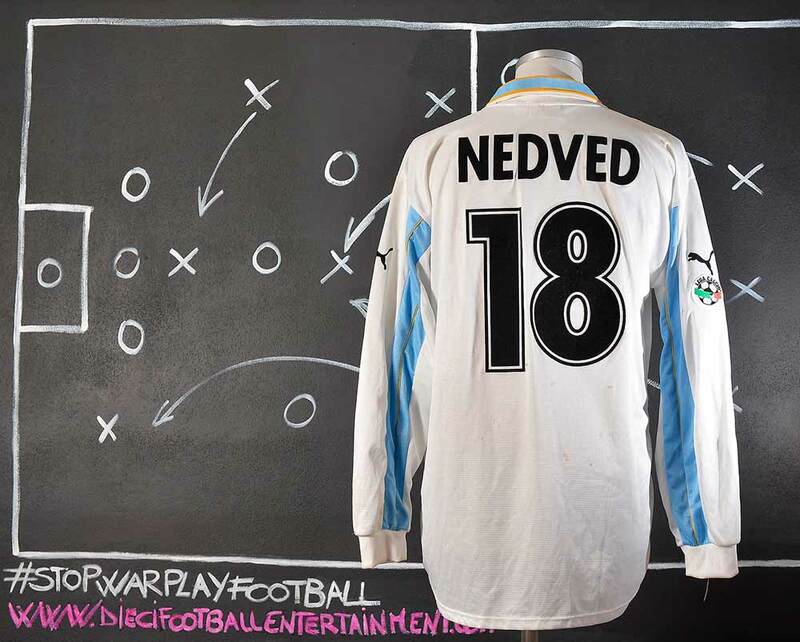 In 2003, he moved to and ended his playing career at Chievo Verona, where he remained until retiring in 2005. 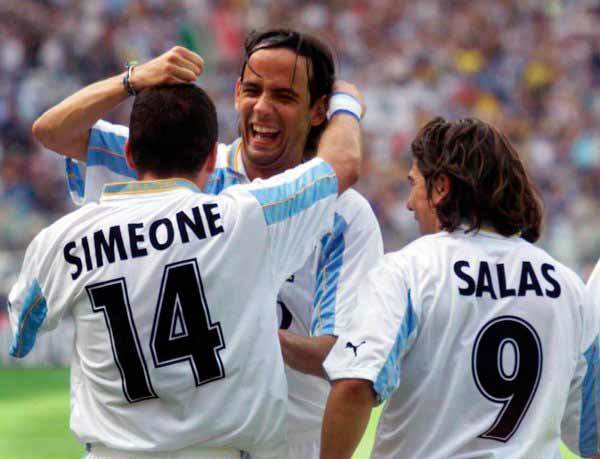 The 2004 Coppa Italia Final was a two-legged affair played between Lazio and Juventus. 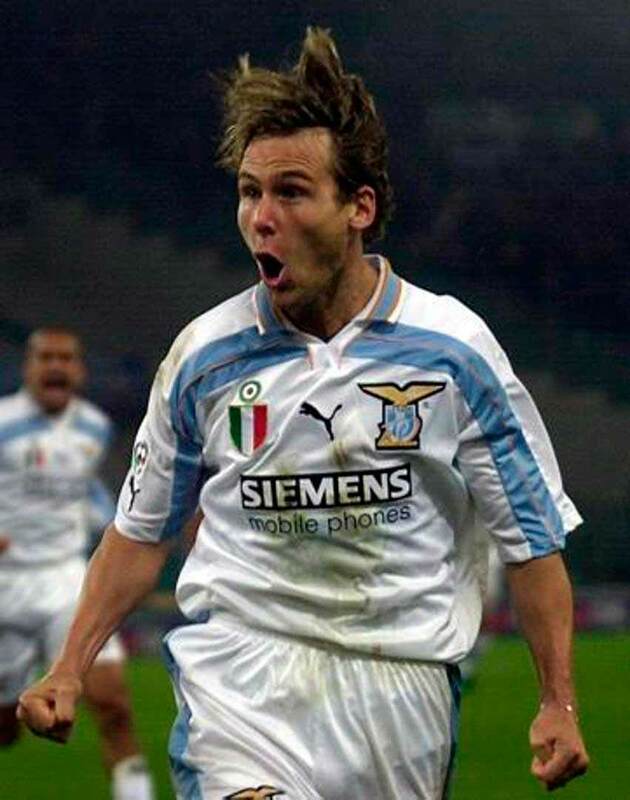 The first leg was played in Rome on March 17, 2004, in which Lazio won 2–0. The second leg was played on May 12, 2004 in Turin and the two clubs drew 2-2, giving Lazio their 4th title on an aggregate result of 4–2. 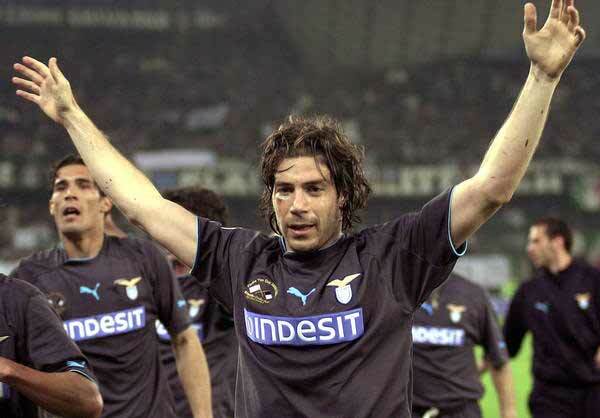 The 2004 Coppa Italia Final was a two-legged affair played between Lazio and Juventus. 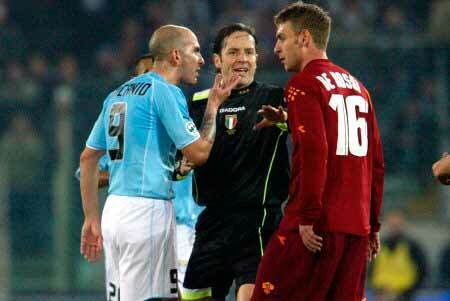 The first leg was played in Rome on March 17, 2004, in which Lazio won 2–0. The second leg was played on May 12, 2004 in Turin and the two clubs drew 2-2, giving Lazio their 4th title on an aggregate result of 4–2. 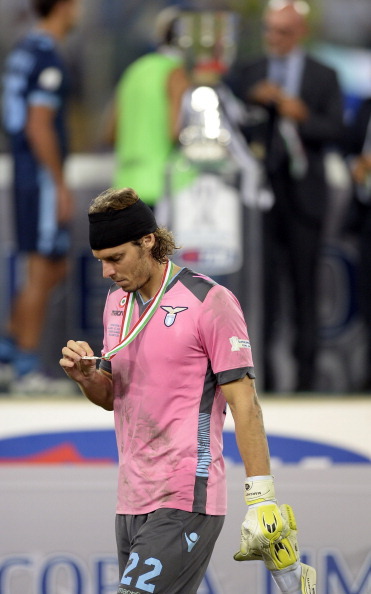 This was the 13th Coppa Italia final appearance by Juventus and the 5th by Lazio. It was the first meeting of these two clubs in the finals. Although his contract with the Biancocelesti ran until 2008, Peruzzi retired at the end of the 2006–07 season: after the 0–0 draw with Roma 29 April 2007, Peruzzi stated that he had played his last match due to the frustration of nagging injuries. However, he was put on in the final few minutes in Lazio’s final home match of the season, a goalless draw against Parma on 20 May, as a goodbye to the fans. 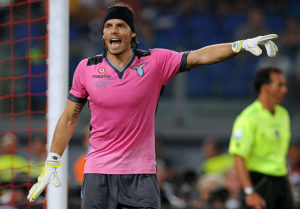 He was named the Serie A Goalkeeper of the Year for the third time in his career on 28 January 2008. Paolo Di Canio during his whole career was almost always wearing size Small shirts. This is something not easy to manage for its teams as such a big small were not usually carried but them. 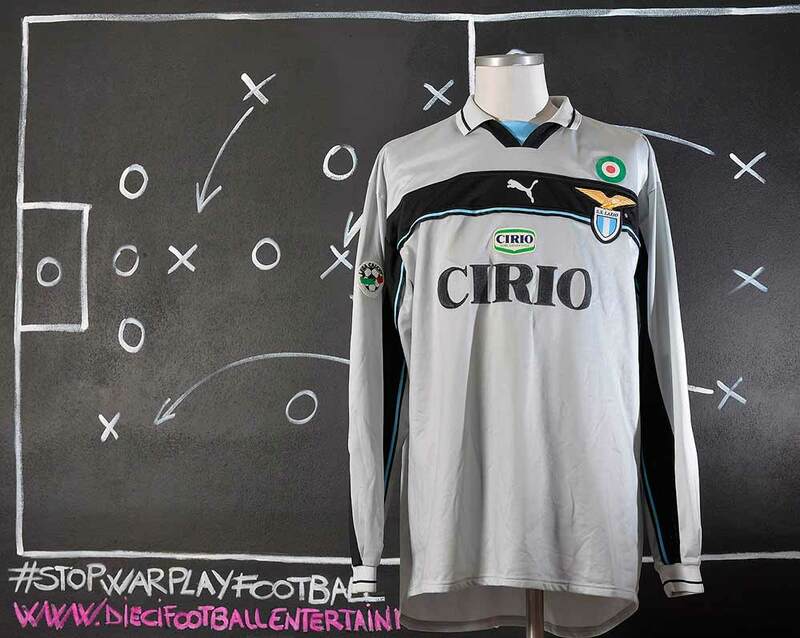 S.S. Lazio for example was getting Size Small shirts for him only as no one else was wearing this size. 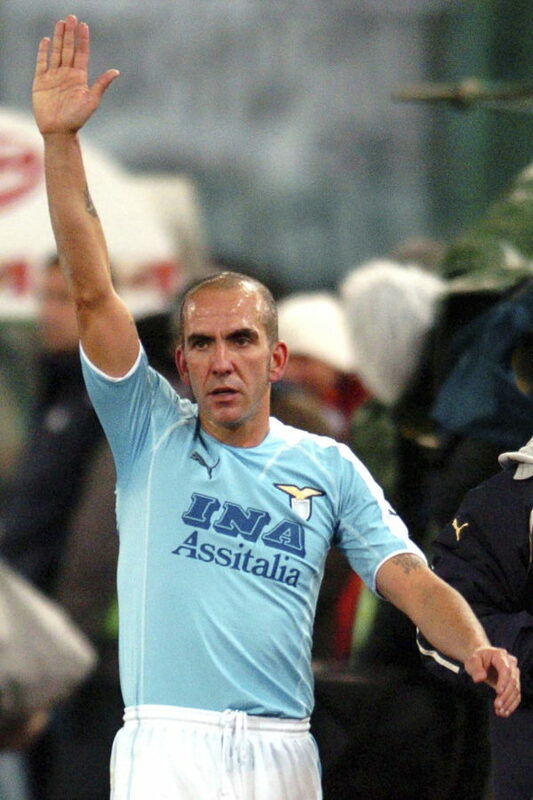 During several of his games for Lazio, Di Canio made a fascist salute to their right-wing fan. His use of the Roman salute toward Lazio supporters, a gesture adopted by Italian fascists in the 20th century, has created controversy. 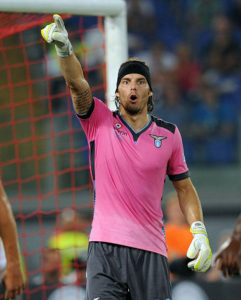 Documented uses of the salute include in matches against arch-rivals Roma and Livorno, a club inclined to left-wing politics. 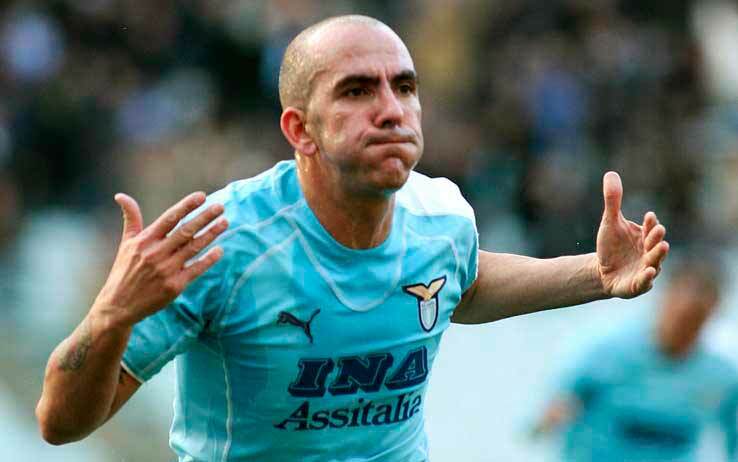 Di Canio received a one-match ban after the second event and was fined €7,000. He was later quoted as saying, “I will always salute as I did because it gives me a sense of belonging to my people … I saluted my people with what for me is a sign of belonging to a group that holds true values, values of civility against the standardisation that this society imposes upon us.” His salute has been featured on unofficial merchandise sold outside Stadio Olimpico after the ban. 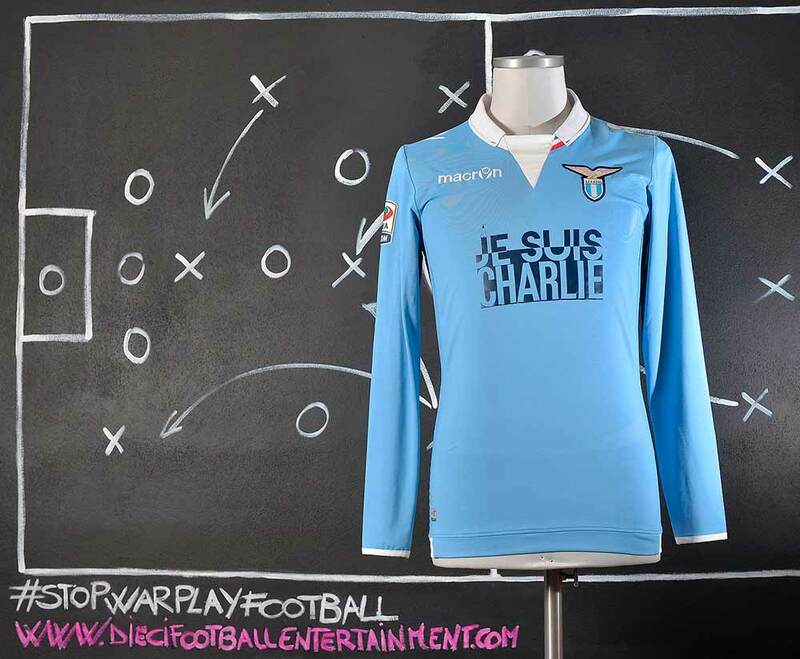 This shirt was used by the team during the “derby” game against Roma which took place on January 15th 2015. 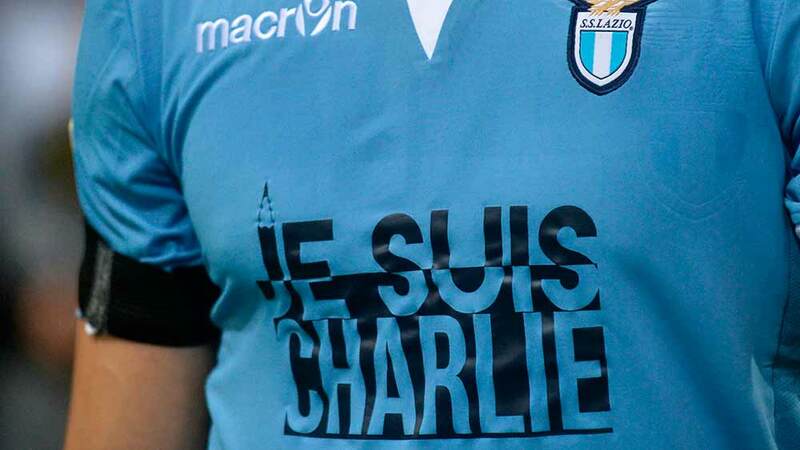 The shirt’s sponsor says “JE SUIS CHARLIE”. 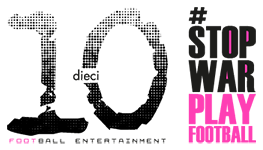 It celebrates the victims of the terrorist attack which took place in Paris on january 11th 2015. This sponsor was used only in this match. 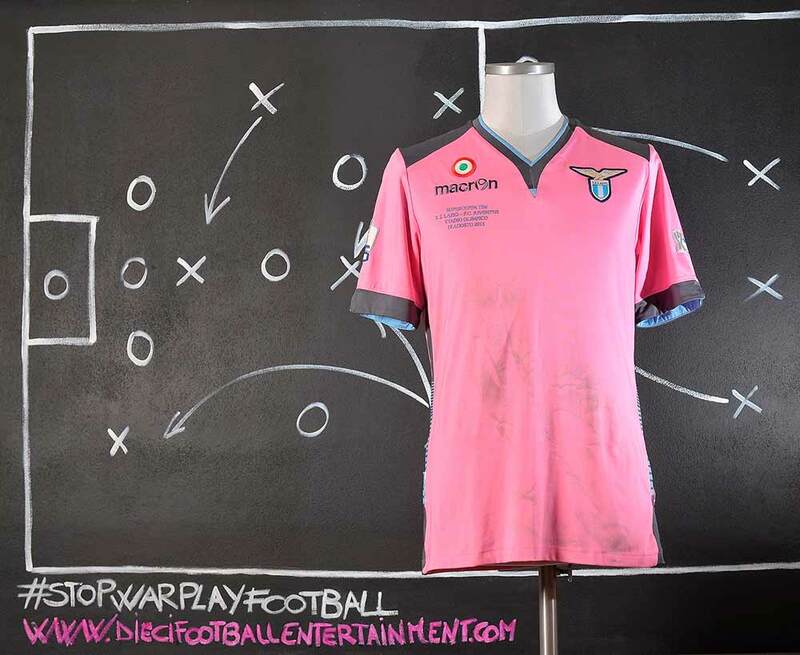 This style of this shirt is inspired by the 1982/1983 team’s shirt. 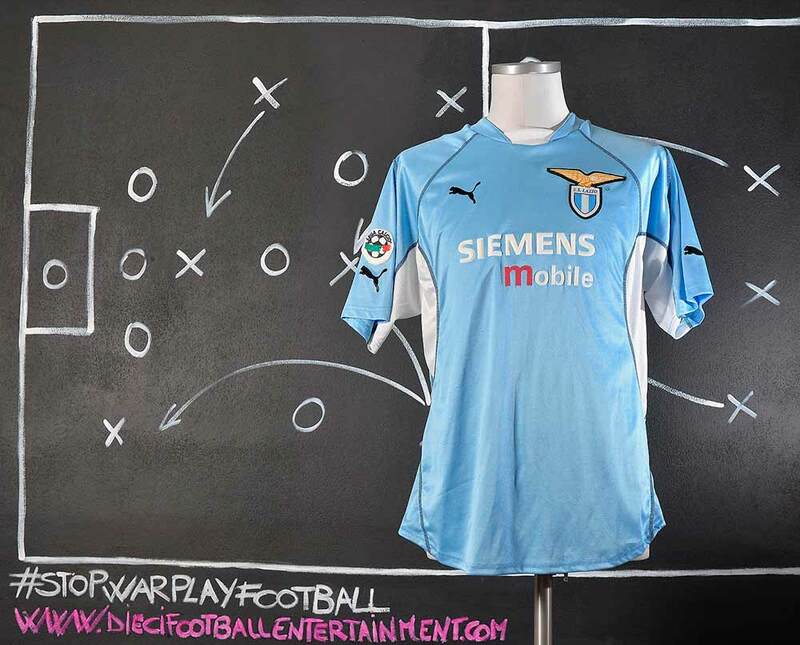 In that year a total innovative design for a football’s shirt was made by the team’s supplier of that time NR. 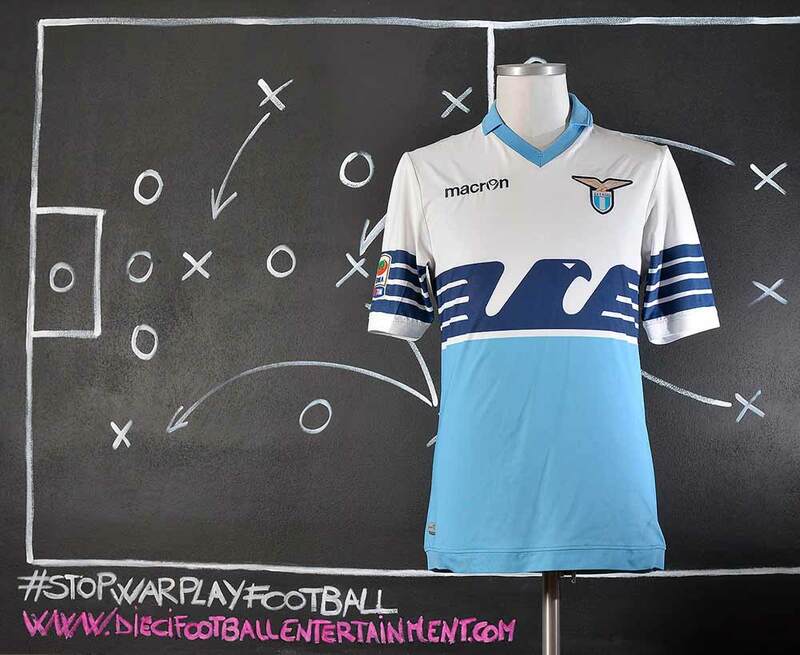 A huge Lazio’s eagle printed on chest, same design of the Lazio’s flag from that era, that sent the team back to the 80’s.